EuLoS.eu is a fast growing logistics company and its directors have more than 20 years experience in the automotive finished vehicle industry. It provides collection and delivery solutions to vehicle manufacturers, fleet operators, retailers and carriers throughout Europe and beyond. The company has offices in Northampton, UK, and Vilnius, Lithuania. Its customers include General Motors, GEFCO and ANWB (The Royal Dutch Touring Club). EuLoS.eu differentiates itself from general car transportation companies. Its services include vehicle distribution throughout Europe as well as into Russia for a number of OEMs; vehicle repatriation from any point in Europe to the vehicle owner’s home country; planning and management of storage and handling facilities for several OEMs; technical intervention such as pre-delivery inspections and vehicle refurbishment for leasing, rental and fleet customers. The range of services the company offers generates mountains of paperwork for the tens of thousands of cars it transports and, with the business growing it was becoming more difficult to provide quick proof of delivery to clients. With PDA-based proof of delivery systems becoming popular with some of the larger companies in the car carrier industry, Chris Martins, the company’s MD, knew such technology was worth investigating. The challenge, however, was to find a suitable system that would bring an organised methodology to the vehicle inspections, together with a comprehensive and instantly accessible audit trail with photographic evidence of defects and electronic signature capture. This would also help with managing and reducing insurance claims. "We may have a truck travelling from Slovenia to Moscow and to get all the paperwork back from the trip could take a week or more. We want to be able to improve on this with an electronic system that provides proof of delivery and computerised documentation that we can deliver to our customers instantly. Such technology improves efficiency and enables greater response and this is particularly important when dealing with insurance claims as vehicle inspection information and photographs can be sent directly from the point of collection," says Chris Martins. OBS Logistics introduced EuLoS.eu to its CALIDUS ePOD proof-of-delivery solution. This tracks delivery and collection journeys and uses mobile devices for electronic signature capture, automatic identification using barcodes, and capturing photographic evidence of shortages or defects. This is a well proven, fully configurable off the shelf solution for any proof-of-delivery and proof-of-service requirement. The system enables time and labour savings because jobs are transmitted directly to the driver’s PDA so there is no paperwork to lose or deface, and there is no additional data entry work out on site or back in the office. It provides electronic management of customer records, full track and trace of deliveries with status updates, image, signature and barcode capture. It also offers the ability to provide same day invoicing to improve cash flow. "I've been in the automotive logistics business for more than 20 years and have seen other companies adopt various systems. I now believe it is the right time for EuLoS.eu to invest in this technology too as it will help us become more efficient for our clients and it will assist business expansion. I was aware of the capabilities of other PDA-based systems, but OBS Logistics showed great interest in what we do and was very enthusiastic in helping to fine tune CALIDUS ePOD to meet our needs. It is a very robust system and the company provides very good support," says Chris Martins. EuLoS.eu will run the system on Motorola ES400 PDAs and use it initially for automating its Europe-wide vehicle repatriation and UK collection and delivery operations. In both cases, the system directs the drivers through the inspections systematically and records each step using simple electronic forms instead of handwriting defect codes onto diagrams and completing lengthy paper inspection documents. Throughout the EU, EuLoS.eu operates a vehicle repatriation service for stranded vehicles on behalf of ANWB. EuLoS.eu collects the vehicle and repatriates it back to Holland. This can involve complex document management as the vehicle will contain luggage and personal belongings that need cataloguing and it opens up opportunities for fraudulent insurance claims. However, using the PDA the EuLoS.eu driver is able to photograph the state of the vehicle at the point of collection, complete a thorough inspection, note specific and extent of defects, and create a full inventory of all items in the car. This information is then available instantly to ANWB, which it uses to update its own system so that their member can track the car at any point en route back to Holland. "Our job is to repatriate ANWB members' cars back to Holland. The system is going to help us improve the efficiency of the collections and deliveries, while providing a comprehensive and traceable audit trail. The moment we complete the inspection and record the contents of the vehicle, we send the information to ANWB. This makes the process visible and helps with managing insurance claims," says Chris Martins. 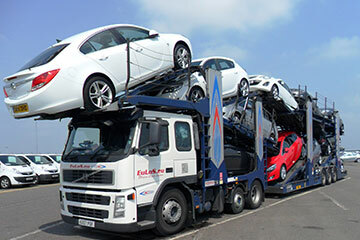 In the UK, the company is providing collection and delivery of new and hire cars. The drivers inspect the vehicles before loading onto their trucks and inspect the vehicles after delivery. Again, the system provides a paperless, step-by-step routine and captures defect information and photographs. Proof of delivery for both manufacturers and vehicle rental companies is very important and EuLoS.eu is now able to meet their needs with CALIDUS ePOD. "New cars are owned by the manufacturers up to the point of delivery, so the quicker they know that their cars have been delivered safely and accepted by the dealership, the quicker they can issue the invoice. Likewise, the sooner we can provide proof of delivery to our car rental clients, the sooner they can have the car on their system and available for hire," says Chris Martins. The system is a major advance on the paper-based methods that EuLoS.eu currently uses. Eradicating paper is clearly a big step forward, but those EuLoS.eu customers that require paper documentation will still get what they need. The advantage being that the system cross-references the documents to a searchable computer record for each car collected and delivered. Because the system is real-time, vehicle defects can be addressed immediately giving full proof of the extent of the problems and enabling simpler management of insurance claims. Carriers often pay very high insurance premiums due to the number of claims made against them and have difficulty of proving who is at fault. The new system gives EuLoS.eu the advantage, as the company will be able to provide photographic evidence of the state of the vehicle when the driver inspected it at collection. For the drivers, the system provides very detailed job information so that they know precisely what each collection entails. This includes full location of the vehicle, photographs of defects, type of vehicle and its dimensions and delivery address. They no longer need constant updates by text message throughout the working day, as everything is available on the PDA and in detail. This also enables them to plan their workload better. Another important benefit is for health and safety compliance, as the system requires the drivers to inspect their trucks before releasing the job information to them. When they have completed their checks using the PDA, the system provides their daily schedule of collections and deliveries. EuLoS.eu and OBS Logistics are working together to provide additional enhancements to the system. These include developing an application that will improve management of working time in line with legislation. In addition, an interface is being developed that will enable direct and remote download of digital tachograph data, which will further streamline administration as there will no longer be a need to manually download the data from the vehicle cab.